January 12 is the Roman date when household Lares were honored. The Lares were the household Gods who lived with each family as protectors. Each person in the family has a Lare and there is also a Lare that protects the whole family as one. Many pagans provide a statue, a bowl of stones, or other focal object, as a home for their family protectors. 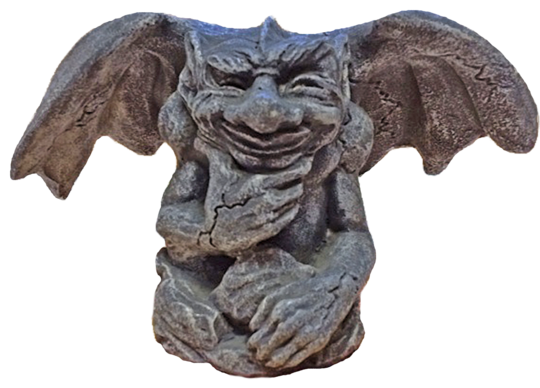 I have a gargoyle statue that looks and acts the part! It's a wonderful idea to ritually honor your household Lares yearly, and what better time than the traditional January 12th? The rite could be considered an annual birthday party for your Lares. Decorate the area around your Lare with pine cones, little statues of forest animals, ivy, holly or other greenery. If your symbol is small enough, place it on your Altar, if not, place it close by. Be sure to clean the Lare symbol thoughougly so that there is no clinging residue of dirt or unwanted baneful energy. Guardian Spirits, I invite you to join me here. You are my friends, and I wish to thank you. I thank you for your protection of this home and all who live within it. I ask for your continued help and protection for me, my family, my pets, and my property. I ask that you drive away trouble-makers, thieves, and others, physical and non-physical, who are bent on evil disruptive purposes. I thank you for your friendship and love. Spend a few moments lovingly caressing the guardian symbol, mentally expressing your love and gratitude. When you are finished, thank them for their presence at your ritual.